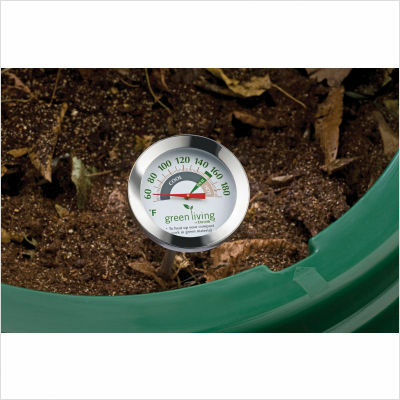 Compost thermometer. Stainless steel construction. 24" Stem with piercing tip reaches the center of the compost to find out the true temperature. 2.5" Diameter aluminum dial with directions for heating up compost and red pointer. Temperature range from 50 to 190 degree fahrenheit with 1 degree resolution. Accurate, easy to use, easy to clean, and long lasting. Overall dimensions: 25" H x 2.65" W x 2.65" D.